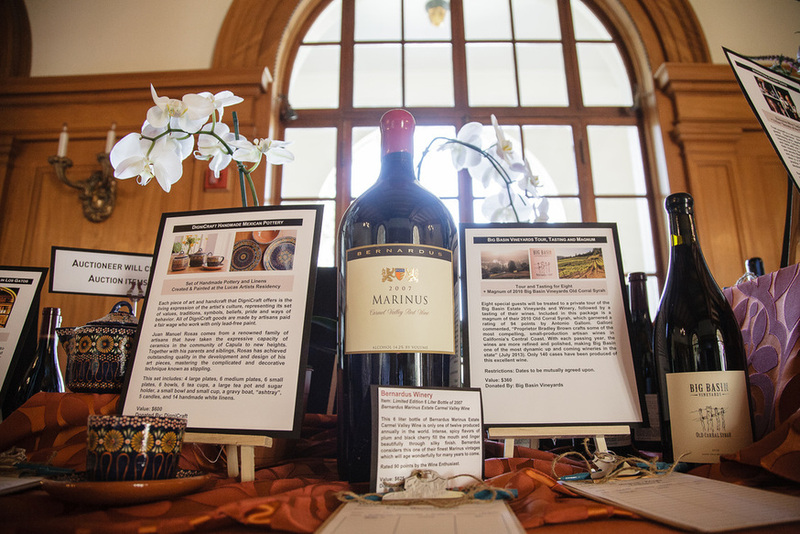 More than 50 fabulous packages will be available for guests to bid on as part of the 2018 Silent Auction, featuring luxury wine packages, and fabulous experiences. You can peruse last year's packages to gain a sense of the type of packages featured at our auction. Stay tuned for the announcement of our 2018 offerings! In 2008, Bruce Munro was invited to propose some alternative lighting designs for a contemporary highland lodge at the head of Loch Ossian in Scotland. He found himself sitting on a step halfway up the main stairs of the lodge absorbing a magnificent, uninterrupted view of the loch and group of snow-capped mountains beyond it. It was raining in squalls against the plate-glass window, which distorted the view with rivulets of water streaming down the panoramic pane. The words “light” and “shower” registered in his mind and he had his idea. The original installation now hangs motionless as if suspended in time, overlooking but not interrupting the view of Loch Ossian. By day it catches glimpses of the sunshine, shedding prismatic flecks of light onto the stairs. By night it morphs into what it is, a shower of light. Light Shower was installed in Salisbury Cathedral, Wiltshire for the Cathedral’s Darkness to Light Advent service procession on November 28, 2010. The photograph was taken by Mark Pickthall of Ionriver. Mark is responsible for capturing much of Bruce’s exhibition and commission work. Bruce Munro, an internationally-acclaimed UK based artist, has created stunning installations around the globe that feature thousands of radiant lights illuminating optical fiber turbines, acrylic pegs, and prismatic rods. His exhibits immerse viewers in a unique intersection of sound, color and light that create an unforgettable and emotive visitor experience. Each exhibit allows him to reimagine and develop past installations for the new exhibit’s landscape, making each show fresh, informed by the site and deeply personal. Clothes that fit like a glove become fast favorites. For over a century, Zegna has made high quality fabric for suits and currently produces suits for high end brands including Gucci, Yves Saint Laurent, and Tom Ford, in addition to its own labels. Meet with the experts at their Palo Alto location, and you’ll soon have a custom tailored suit to add to your favorites collection. Walk down the street or into a business meeting wearing a striking, perfectly fitted suit by Zegna, and you’re sure to make a power-packed statement. 2 Night Stay for 4 + VIP Wine Tasting + Benovia Wine + Chef's Dinner at John Ash & Co.
You and your guests are in for a delightful wine country getaway at Benovia’s vineyard cottage in Santa Rosa, overlooking the Russian River Valley. Sip wine while looking out over prized Russian River Valley vineyards during your VIP wine tastings at the winery; enjoy the inviting, relaxing, and warm ambiance of the cottage featuring two bedrooms, two complete baths and a well-appointed kitchen. Let your stress melt away while sitting in a hot tub overlooking vineyards under the stars. To top it off, you and your friends will get to revel in a multi-course dinner carefully crafted by Executive Chef Thomas Schmidt at the revolutionary John Ash & Co. restaurant in a wonderful vineyard setting. Their sommelier will meticulously pair the courses with delicious Sonoma County wines as an added treat. Restrictions: Reservations at John Ash must be made at least 30 days in advance. Dinner to be arranged with Chef Schmidt. Valid any night. Expires September 30, 2018. This is a tour you don’t want to pass up! Your experience will begin with a serene excursion through the Chalk Hill Estate vineyards, located in Sonoma Valley, including a stop at the estate’s culinary garden where organically-farmed produce is the inspiration for their Executive Chef’s culinary artistry. Finally, you’ll arrive at their glass conservatory with sweeping views of Chalk Hill Valley and the equestrian center. At the conservatory, you will experience a sit-down tasting of the estate’s acclaimed wines paired perfectly with small, scrumptious bites. Restrictions: Expires September 30, 2018. All reservations subject to availability. Get ready to get schooled in the art of deliciousness! This private cooking class and wine tasting is enjoyable for classically trained chefs to everyday cooks. The two-and-a-half-hour-long event begins with a welcome reception, featuring a selection of beverages and a gourmet cheese platter. Then, one of the ICC’s Chef-Instructors will teach your group how to cook a dish that’s sure to impress! After cooking in the kitchen, everyone will dine on the dish de jour, along with sides and dessert provided by our Chef-Instructor, in the ICC’s private dining room. Following the meal, a Certified Sommelier will take the group through a blind tasting of red and white wines, focusing on the flavors, aromas, and general characteristics of each wine. Restrictions: Expires: Sept. 10, 2018. Must schedule 14 days in advance. Mon-Thur classes. Max 10 people. Class conducted at the Campbell facility. Join Keller Estate Winery for a memorable tour for six of their scenic winery and vineyard, located in Petaluma, all while sipping delicious Keller Estate wine. Visit the estate’s beautiful wine cave while savoring Chardonnay. As you finish the first part of your tour, you will enjoy a special viewing of the Kellers’ vintage Italian classic car collection. From their sun-bathed terrace (weather permitting), you’ll discover breathtaking views of the Petaluma Gap and Mount Tamalpais while enjoying Pinot Noir—and you definitely won’t want to miss the unbeatable photo opportunity! Restrictions: Open by appointment Friday, Saturday, Sunday, and Monday. Reservations must be made 24 hours in advance on a mutually agreed upon date. With two other couples, you will have the opportunity to embark on a private tour of the winery and vineyard set in the scenic Russian River Valley in Sonoma County. Following the tour, you will enjoy a seated tasting of three different wines in the historic vineyards, along with a delectable lunch featuring the Bilbro family’s special recipe wild boar sausage. Each couple will leave the experience at Limerick Lane with a signed 1.5 liter bottle of 2015 Russian River Zinfandel – described as having a bright and elegant palate, with aromatic notes of cherry compote and blood orange. Sit down to a gourmet dinner in the elegance of Montalvo’s historic Villa, prepared by 15 of the Montalvo Service Group’s great cooks. You and nine others will be escorted into Senator Phelan’s library, where champagne and hors d’oeuvres will await. Afterward, you’ll proceed to the dining room, where the table will be set with beautiful linens, china, elegant silver candelabras and fresh flowers. You’ll enjoy a five-course meal, accompanied by wine. Finally, end the evening enjoying good conversation while sipping coffee and cordials in the library. Seats at this dinner will be sold in pairs. Restrictions: Minimum Bid: $300/couple. Montalvo Service Group can accommodate vegetarian diet, but no vegan diets, unfortunately. Join the Saratoga Pie Guy, Jim LeBlanc, a Saratoga Rotary legend and master maker of pies, as he guides you through the creation of a delicious apple or apple cranberry pie (your choice). Class will be held in Marcia and Russ Hansen’s spacious Saratoga kitchen and creativity will be enhanced with wines from Russ’s collection. Four pies will be baked and two people can work on one pie – as long as they’re willing to split it up at the end... We’ll leave that to you. Just like to watch? $100 to watch pie-making and/or football games and drink Russ’s wine. Take home an experience to remember! You and three other friends will enjoy a one-hour guided horseback ride through Cooper-Garrod Estate Vineyards to the Fremont Older Mid-Peninsula Open Space Preserve on the eastern slopes of the Santa Cruz Mountains, followed by a private tour of the winery and tasting. You will also get to take home a 6-bottle “Now and Then” wine box comparing their 2010 Cabernet Sauvignon (which received a 94-point rating from Wine Enthusiast) with their library 1999 Cabernet Sauvignon (3 bottles of each vintage). May we suggest a double date? Restrictions: Open daily, 12-5pm. Valid through September 10, 2018. In addition, you’ll enjoy a trip to their tasting room with three of your friends! Taking a step back into Old Italy, the large wooden beams, stone walls and terracotta tile of the tasting room provide a relaxing backdrop to enjoy your tasting experience. As one of Northern California's wine pioneers, the Guglielmo family has been producing award-winning wines in the Santa Clara Valley since 1925, a winemaking tradition that has spanned three generations. Restrictions: Open daily 10am – 5pm, closed major holidays. ​Intercontinental Hotel on Avenue of the Stars! One incredibly lucky winner and one incredibly lucky guest will get to go backstage to watch a live show of the NFL Network's Emmy-nominated NFL GameDay Morning (6am-10am) in the Culver City (Los Angeles) Studio, with Steve Mariucci, Rich Eisen, Marshall Faulk, Michael Irvin, and Kurt Warner as they discuss the upcoming games four hours prior to kickoff. You’ll also get to take home a framed authentic autographed jersey by John Elway and enjoy accommodations for one night at the sophisticated InterContinental Hotel on The Avenue of the Stars. Get the VIP treatment at a 2017-2018 Oakland Raiders game of your choice! In addition to providing the best view of the game, Club Seats offer extra amenities such as preferred parking, exclusive restrooms, and concession stands that serve incredible food not found anywhere else in the stadium. Club Seat-holders also have access to two new Stadium Clubs, which feature full-service bars, spacious lounge areas, concierge service, coat checks, seated dining with a view of the playing field, and plenty of video monitors that bring you all the NFL action from around the league. Restrictions: 2017-2018 regular season home game to be mutually agreed upon by October 10, 2017. The lucky winner of this package will get to choose almost any Sharks game during the 2017–2018 season! You decide: use either four tickets for a single game (limited availability) or two tickets for two games (most games available). The winner of this bid will also receive parking at the game, Club access, and you’ll even take home a signed hockey puck by Chris Tierney! The seats are located at center ice behind the penalty box. With prime tickets like these, you’ll be able to experience the rush of the game like never before! Restrictions: 2017-2018 season only. Call early: games subject to availability. Few car collections rival Jay Leno's world-famous garage. Made popular by the NBC-produced web series–Leno’s Big Dog Garage, which has become one of the most popular shows on YouTube–this astonishing display of machinery is estimated to include more than 150 cars and motorcycles...some of which could well be included in the Smithsonian! Displayed in a series of hangars at the Bob Hope Airport in Burbank, Leno’s cars are maintained by a meticulous crew of mechanics, including Jay himself. And what’s more, all cars are licensed and ready to drive at all times. You and three others will have the thrill of perusing cars ranging from the legendary McLaren F1, to Bugattis, Lamborghinis, Duesenbergs, Maseratis, and so much more. Restrictions: Must be 16 years of age or older – no exceptions. Valid from 10am–3pm, and visit lasts approximately 1 hour. No weekend or holiday visits. Mr. Leno will not be present. Expires September 10, 2018. Cannot be resold or donated for any reason. This package is a theatre-lover’s dream! Attend an A.C.T. preview performance of your choice at these San Francisco theaters: The Geary Theater, The Strand Theater, The Rueff, or The Costume Shop with a friend and experience a dynamic show chock full of talented performers. A.C.T.’s 2017–18 season is filled with big, bold, highly theatrical work that brings modern classics to life with the most vigorous contemporary artists, beginning with the return of Shakespeare to The Geary with Hamlet and culminating with A Walk on the Moon, a world-premiere musical based on the hit movie. You’ll also enjoy a TheatreWorks production of your choosing. Their new season features contemporary works as well as re-imagined classics, from Prince of Egypt, featuring a multi-ethnic cast, to Around the World in 80 Days. Theaters are in Mountain View and Palo Alto. You’re sure to walk away inspired! Restrictions: A.C.T. : Subject to availability. Excludes Premiere Orchestra seating; TheatreWorks: Valid for any Tuesday-Thursday, or Sunday evening performance. Subject to availability. Expiration Date: July 1, 2018. You and three guests will have the opportunity to tour Anchor Distillery’s beautiful penthouse garden and take in the aromas of the fragrant botanicals used to produce some of Anchor’s fine spirits. You’ll also experience breathtaking views of historic San Francisco from the Potrero Hill penthouse bar where you will enjoy a one-hour, expert-led tasting of Junipero Gin, Old Tom Gin, HOPHEAD Vodka, Genevieve Gin, Old Potrero 18th Century Whiskey, and Old Potrero Straight Rye Whiskey: the spirits that sparked a craft distilling revolution. Restrictions: Expires 12/31/17. Guests must be over 21 years of age. Subject to availability. Seatings are limited–reservations are highly encouraged. Immerse yourself and your family into a world of art and discovery! Children will develop creativity and conceptual thinking skills all while having fun at the Bay Area Discovery Museum. At the Walt Disney Museum, located in the Presidio, people of all ages will enjoy a unique look at the life and times of the influential Walt Disney. Finally, engage with 4,000 years of ancient and European art at the Palace of the Legion of Honor or experience a diversity of art from around the world at the de Young Museum. Restrictions: Bay Area Discovery Museum: Expires December 31, 2018. Hours are Tuesday – Sunday, 9am – 4pm. Not valid on select holidays or for special events, performances or Goblin Jamboree; Each pass must be used in one visit. Walt Disney Family Museum: Valid for general admission only. Closed Tuesdays and January 1st, Thanksgiving Day and Christmas Day. Children 5 and under are free. Enjoy a beautiful afternoon or evening on the water aboard the Chardonnay II! You and a friend will depart from the Santa Cruz Yacht Harbor for a two-hour sail through the Monterey Bay National Marine Sanctuary to enjoy one of their many exciting sailing charters, ranging from Champagne brunches to Hawaiian Grill charters, from whale watching to winemaking, and more. Take in the beauty of the coastline while catching glimpses of protected wildlife. Relax on the spacious 70 ft. deck or in the comfort of the gallery. Happy sailing! Take college football to a whole new level with seats on the 50 yard line, section 113 of Stanford Stadium! From this stunning (and shaded!) location, you will watch as the Stanford Cardinal and Arizona State Sun Devils go head to head! Go adventuring in San Jose with tickets to the Tech Museum and Happy Hollow Zoo! Engage yourself in educational, exploratory, and provocative technological interactions at The Tech with seven of your friends, or enjoy multiple outings with smaller groups. Get immersed in hundreds of thrilling exhibits through drop-in activities that incorporate fascinating engineering feats and experimentation that pique your curiosity. Next, head over to Happy Hollow’s Park & Zoo to visit animals, stop by the puppet theater for an entertaining show, and enjoy rides. Restrictions: Weeknight date to be mutually agreed upon. Expires June 30, 2018. Renowned travel writer Horace Sutton once described The Inn at Saratoga as “one of the most splendid small inns in the nation.” Treat yourself to a serene escape with the pristine natural environment of Saratoga’s wooded foothills as your breathtaking backdrop. Situated next to a quiet, burbling stream, The Inn at Saratoga boasts spacious rooms, floor-to-ceiling French windows, private balconies, high-speed internet access, 47” HD flat screen televisions, room service, continental breakfast and coffee, and afternoon wine, cheese, and tea for their guests. Its location provides ideal, walkable access to boutiques and a wide variety of wonderful restaurants and wine tasting rooms. Plus, the nearby Mountain Winery, Hakone Gardens, Montalvo Arts Center, and miles of hiking and horseback riding trails are practically at your doorstep. Retreat from the everyday to-dos and unwind! Restrictions: Not valid on holidays, based on availability and advance reservations. One or two people per accommodation. Expires December 29, 2018. Dine and drink at one of the premier bar and grills in Silicon Valley. Jack Rose relentlessly pursues perfection of the latest and greatest reiteration of the familiar while consistently trying to push the boundaries of what can be done with a cocktail. The bar offers unique concoctions like the fruity, vodka-based “This Side of Paradise” and the seasonal gin-based “Jackalope.” The menu features a delicious variety of culinary options, from several pizzas and “Bourbon Pecan Bread Pudding” to “Mama’s Banana Maple French Toast” and “Spicy Chicken Tinga.” With a spacious outdoor beer garden, bright outdoor patio, cozy private enclaves, and a fully stocked bar, you’ll find Jack Rose to be a welcoming, lively environment. You’ll also take home a t-shirt from Jack Rose to remember your experience! The highly esteemed San Francisco restaurant Kokkari Estiatorio, featured at Montalvo’s 2017 Food & Wine Classic this evening, is known for making guests feel at home with their rustic Mediterranean ambiance and their freshly crafted Greek cuisine. The food at Kokkari brings together old and new, modernizing Greek dishes while preserving their signature tastes and elements. Now you can bring the favorites of Kokkari to your own dinner table with their cookbook, Kokkari: Contemporary Greek Flavors. This book features both classic and modern Greek flavors that are sure to make your mouth water! Enjoy a day packed with fun at Pier 39 with your family! Spend a relaxing hour with a 360 degree view of San Francisco Bay on the SF Bay Cruise Adventure, where you’ll learn about the history behind famous San Francisco landmarks. Take a ride on the iconic carousel, handcrafted in Italy. Embark on a thrilling adventure on RocketBoat, a high speed boat ride led by a captain who will take you on twists and turns past the Bay Bridge. See the beloved City from a new perspective! Enjoy an unforgettable shopping experience in the fashion central of Silicon Valley with seven of your girlfriends! While sipping a glass of wine or champagne, peruse fashion finds at three pre-selected stores on The Row. During your shopping experience, you will be accompanied by a personal stylist who will provide you and your friends with fashion tips and tricks. You’ll also dine in style at a restaurant of your choice on The Row. To top it off, this exciting package includes round-trip transportation from a location of your choice. It’s the ultimate girls’ afternoon out! Restrictions: Valid Monday-Friday until December 31, 2017. One alcoholic beverage per person is included with lunch, no bottle service. SFJAZZ center, located at Miner Auditorium, features unique performances, such as musical adaptations of graphic novels and ethnically incorporated, dynamic sets. Opera San Jose’s upcoming, inventive production of La Bohème, is a show filled with passion and hope. Updated to take place in Paris towards the end of World War I, La Bohème tells Puccini’s story of a tragic romance. In the December 9 Palo Alto Philharmonic show, Scenes and Characters, the orchestra will perform iconic pieces, including Stravinsky’s Petrushka, as well as Saint-Saens’ bewitching Piano Concerto No. 2, while the Winchester Orchestra will sweep you away with Tchaikovsky’s famous Piano Concerto No. 1 and Beethoven’s dramatic Symphony No. 7. Restrictions: SFJAZZ expires June 2018. This is an absolute must-have experience for any Harry Potter fan! Not only will you get to view Harry Potter and the Prisoner of Azkaban on a big screen, the action-packed flick will be set to a live performance of the soundtrack, performed by Symphony Silicon Valley’s incredible orchestra inside the stately San Jose Center for the Performing Arts – home to prestigious performing arts groups including Broadway San Jose. Choose from these dates: October 27 at 7pm, October 28 at 2:30pm or 7:30pm, or October 29 at 1:30pm. Restrictions: Seating is on a space-available basis. Does your life ever feel frenetic? Do you wish you had more time to spend doing the things you love or taking time for the people that mean the most to you? Urbane Concierge offers you the opportunity to do just this. With 10 luxurious hours of personal assistance at your disposal, your concierge can accommodate more than just basic errands; they can help with appointment setting, travel and event planning, personal shopping, house and pet sitting, life organization, lifestyle services, and bill paying. Time is precious. Make it count! Restrictions: Valid for a minimum of 3 hours per request. Offer expires March 31, 2018. Some blackout dates apply. Canneti Roadhouse Italiana, located in Forestville, is alive with its custom made rustic tables and stools, refinished wood counters and a Tuscan Country flair. Chef Francesco Torre’s cucina is a mix of many experiences, from a Relais & Chateaux two-Michelin-starred restaurant to a simple Tuscan Trattoria, a Louisiana Church BBQ to Long Island country style. Enjoy the elegant dishes masterfully prepared by chef Torre in this exquisite wine-country setting! Restrictions: Reservation required and dependent on availability. Not redeemable on major holidays. A.P. VIN specializes in handcrafted, vineyard-designated Pinot Noir, each bottling offered in very limited production releases, and each showcasing the flavors and nuances of the various prized vineyard sources and distinct vintages. Owner Andrew P. Vingiello believes making wines of the highest quality starts in the vineyard. From the vineyard and row locations to the farming style of each grower, every element adds nuances and subtleties that result in a superior wine. This delectable package includes a mixed case of A.P. VIN's small-lot, California artisanal Pinot Noirs, known for their boldness and complexity. These 2016 Pinots should reach maturity within the next few years. Take home three magnums of Artesa's delicious, gold-winning wine. Artesa winery was designed by world-famous Barcelona architect Domingo Triay and specializes in small lots. The winemaker describes the 2014 Estate Reserve Pinot this way: “On the nose, it offers beautiful, bright aromas of black cherry, plum, and a hint of rose petal and violet aromas. On the palate, lush red and blue fruit flavors are accentuated with hints of spice and earth. The natural acidity gives vibrancy and it is an excellent partner to so many foods; it is medium bodied and has a long finish.” The lucky bidder will also enjoy a Spanish tapas and wine pairing for two, where small bites will be expertly coupled with Artesa’s artisanal, small production wines. As the lucky bearer of this certificate, you and your group of up to 7 will head up to Artisan Wine Depot in Los Gatos for an informative VIP Wine Tasting guided by one of Artisan Wine Depot’s certified sommeliers! Artisan Wine Depot in Los Gatos is a full-service retail store and online merchant of fine wines, craft beers, and premium sake. They offer many hard to find, "under the radar" boutique wines. You definitely don’t want to miss what they’re pouring! Join Big Basin Vineyards owner and winemaker Bradley Brown as he hosts you and nine special guests on a private tour of the Big Basin Estate Vineyards and Winery, followed by a tasting of their wines. Included in this package is a double magnum of their 2011 Old Corral Syrah, which earned a 94-point rating from Wine Enthusiast. It showcases a peppery scent with hints of boysenberry and spice. Restrictions: Available by appointment at a mutually agreeable time. Expires December 30, 2018. Located in the heart of Napa Valley’s famed Stags Leap District, Clos Du Val offers one of wine country’s most gracious wine tasting experiences. Their picturesque estate offers an unforgettable setting for you and 7 friends to savor their acclaimed wines: from the grandeur of their renowned Cabernet Sauvignons and the vibrant allure of their Pinot Noirs and Chardonnays. In addition, take home a bottle of their flagship Cabernet. The limited availability 2013 Estate Cabernet Sauvignon sourced from the famed Stags Leap District has been described as a 95-point “stunner” that is rich, warm, and layered, with aromas of blackberry pie, black cherry, red currant, baker’s chocolate, pencil shavings, coffee grounds, sweet wood, and black pepper. Enjoy a double magnum of J. Lohr Hilltop Cabernet Sauvignon in a wooden gift box from this Central Coast winery committed to sustainability and quality. This elegant Cabernet is described as having "rich, intense fruit upon release." In addition, you and five others will get to indulge in a J. Lohr wine and cheese tasting event on a Friday evening at the J. Lohr San Jose Wine Center. During the event, the wine bar is open after hours and weekly flights of wines are expertly matched with flights of gourmet cheeses. Restrictions: Valid between 5:30-8:30pm Fridays. Advance reservation required. With a $500 gift certificate in hand, peruse premium wines, wine-related gifts, and gift baskets from this expertly stocked wine hub and take home something that makes your heart sing. This third generation family company has been in the wine distributing business for 75 years and, as one of Northern California's largest distributors, maintains personal relationships with owners of some of the best wineries in California. The Joseph George vineyard is located in the heart of the Napa Valley and has won over many “red only” drinkers as their favorite white wine. They are proud to be the house white for many of Napa Valley's winemakers and owners. The Joseph George Wine Shop is conveniently located in Willow Glen. Tonight, take home a bottle each of the three wines being showcased at Montalvo’s Food & Wine event: Kings Mountain 2012 Clone 13 Pinot Noir, 2012 Bacchus Pinot Noir, and 2008 Meritage to remember your experience at Montalvo! You’ll also receive a one year membership to their wine club: approximately 400 cases of Kings Mountain Pinots are produced each year, and as a member you’ll have access to each vintage before the public does. In addition, you’ll receive one shipment of three bottles each (six bottles total): a new vintage release of Kings Mountain Clone 13 Pinot Noir and Kings Mountain Bacchus Pinot Noir (mid October). You’ll receive 15% discounts on all subsequent purchases, plus, you’ll be invited to an exclusive vineyard event on October 29 – open to wine club members only (the private Woodside estate vineyard is not open to the public and can only be visited by invitation). Restrictions: *Bike route is customizable; however, bikes must be provided by donor. Own two fabulous wines in souvenir bottles! Take home two signed magnums of Merry Edwards’s delicious Pinot Noir: Merry Edwards 2013 Olivet Lane Vineyard Pinot Noir and 2013 Klopp Ranch Vineyard Pinot Noir. You’ll also get to take a trip with five friends up to the Russian River Valley to visit the Merry Edwards Winery, where you will receive a seated, in-depth private tasting, followed by a tour of the working winery. Nestled amid the vines at Coopersmith Vineyard, tastings educate visitors about Merry's handcrafted Pinot Noir and Sauvignon Blanc. Merry Edwards, a legendary local female vintner who started several wineries, is a seven-time finalist for the James Beard Foundation's award for Outstanding Wine and Spirits Professional, and was named one of the 50 Most Influential Winemakers in the World (2004) by Wine and Spirits Magazine. Her Pinot Noir and Sauvignon Blanc regularly land spots in the Top 100 Wines in the World from Wine Enthusiast and in 2014 (her 40th year as a winemaker) Merry was inducted into the Culinary Institute of America's Vintners Hall of Fame! Restrictions: By advance appointment only. Date and time to be mutually agreed upon. Plus, Two of their Limited Edition, Top-Rated Wines! The lucky bidder of this item will take home a mixed case of Merryvale Napa Valley wines, including two bottles of their Profile Red 2013 Bordeaux Blend, rated 92 points by Robert Parker of the Wine Advocate; two bottles of their 2014 Silhouette Chardonnay, rated 94 points by Robert Parker with his note that “it could pass for a grand cru from Burgundy’s Côte d’Or in a blind tasting” (if that doesn’t just say, “bid on me!”); three bottles of their 2012 Cabernet Sauvignon, rated 92 points by Robert Parker; plus, a selection of other Merryvale wines, including Pinot Noir, Chardonnay, and a magnum of their second label, 2012 Forward Kidd. Straight from the local, boutique winery! Wine Spectator has referred to Mount Eden as "texture masters,” as their old vines are known for offering low yields of tiny grapes. Mount Eden is considered to have the longest lineage of Chardonnay in North America. Estate Chardonnay, farmed on a rugged mountain top in the Santa Cruz Mountains, originated from vines propagated from the original Paul Masson vineyard in France. Low-yield vines and a long growing season allow for steady grape maturation and intensification of flavors, making these wines superb. This wine lot features a wonderful magnum each of their 2012 Chardonnay, 2013 Pinot Noir, and 2010 Cabernet. Take home two incredible magnums, rated 93 and 94 points by Robert Parker: Pahlmeyer’s 2010 Merlot has a firm core of tannins, providing its underlying structure. This juicy, dark, yet wonderfully sophisticated and polished wine impresses for its balance and overall sense of harmony. Layers of fruit flow effortlessly to the long, voluptuous finish. It has an anticipated maturity now through 2025. Their 2013 Chardonnay displays beautiful honeysuckle, lemon oil, and hints of nectarine and poached pear, and has a Burgundian, Bâtard-Montrachet-like texture and richness. The wine is sensationally rich and once again a great success from this winery, which has had such an incredible track record for world-class Chardonnays. This should drink well for another 1-3 years, as their record for aging is brilliant. The lucky winner of this fabulous item will get to tour the famed Pride Mountain wine caves with five other friends, followed by a tasting session, all the while enjoying stunning views of rugged Mount St. Helena and verdant vineyards. The winery sits on the crest of the Mayacamas Mountain Range and contains ruins of the original winery (over 100 years old). See how the current Pride family winery, half in Napa and half in Sonoma, is split down the center of the crush pad! Included in this fantastic package is a double magnum of their delicious 2012 Merlot. This wine is described as “exuberant, with aromas of plum, raspberry, strawberry, sandalwood and cocoa – a palate of fruit.” Full of silky tannins with a lingering aftertaste, this wine received a rating of 90 from The Wine Advocate for its full-bodied goodness. Restrictions: Must schedule in advance. Available Wednesdays through Mondays only. Holidays excluded. Restrictions: Two week minimum notice must be given when making a reservation. You and three friends will hone your knowledge of the art of noteworthy wine production as you enjoy a VIP tour at Silver Oak Cellars, followed by a tasting of their wines. In addition, you’ll take home a magnum of their 2013 Silver Oak Alexander Valley Cabernet Sauvignon – a wine regarded by Northbay Business Magazine critics as “consistently elegant and revered internationally as one of the top Cabernet Sauvignons in the world.” The winner of this item will also get to take home a pair of lovely etched Silver Oak wine glasses to remember your evening at Montalvo’s Food & Wine Classic! Restrictions: Reservations required. Subject to availability. Tour to be redeemed at either their Napa Valley or Sonoma County facility. Conveniently located right off Sonoma’s historic town square, Sojourn Cellars invites you and seven friends to enjoy a VIP comparative tasting! Presented in side-by-side format, their comparative tasting allows guests to experience the nuances and distinctive qualities in their portfolio of vineyard sites from the Sonoma Coast, Russian River, and Napa Valley appellations. Based in Sonoma, Sojourn Cellars specializes in the production of artisan Pinot Noir, Chardonnay, and Cabernet Sauvignon wines. They consistently produce remarkable wines with a hands-off natural winemaking style that showcases the character and personality of the individual vineyards. Restrictions: Available by appointment Sunday – Friday only. Must book in advance. 2000 Taylor’s Quinta de Vargellas Vinha Velha Vintage Port (not available in the marketplace): About 2,500 cases worth of juice was harvested from the old vines parcels, yet only 240 cases were vinified as Vargellas Vinha Velha. The balance became the backbone for the 2000 Taylor Vintage Port. This port is rated 95+ points. Fonseca 1994: Rated 100 points by Wine Spectator, this port was ranked as the Top Wine of 1997, Cellar Selection. Hold on to your hat: this is the best Fonseca since 1977, and it's probably even better than that classic vintage—more like the breathtaking 1948. Mind-blowing, with masses of color, aroma and fruit flavor. Big, full-bodied and very sweet, with tons of tannins and a sweet finish. Tannic and huge, it's a long-term, great Port. Croft 2000 Vintage Port: A striking, individualistic nose of spring flowers, blackberries, blueberries, and lead pencil shavings emerge from this saturated purple-colored 2000. Evolved yet expansive, sweet, and generous, it admirably conceals moderately high tannins under a wealth of fruit and glycerin. Take home a delicious bottle of 2012 Comstock Cabernet Sauvignon, as well as a Terrace Tasting for four! The Terrace at Comstock Wines is a magical place, overlooking their Estate Merlot Vineyards. They find it the ideal place to enjoy the beauty of Dry Creek Valley and fully immerse in the distinct varietals that thrive in Sonoma County. Enjoy a private tasting of six of their favorite wines and a small bite pairing. Dutcher Crossing Winery represents an authentic and enjoyable experience for wine-lovers who visit the beautiful Dry Creek Valley. The perfect blend of award-winning wines, gorgeous wine country views and warm hospitality will await you on your tour and tasting for four! In addition, you’ll take home a beautiful, etched double magnum of Dutcher Crossing’s 2015 Proprietor’s Reserve Cabernet Sauvignon to savor your Dutcher experience further. Restrictions: Reservations must be scheduled 2 weeks in advance. Ruby red in color with enticing aromas of red raspberry, strawberry and spice, Papapietro Perry’s Russian River Valley Pinot Noir has a beautiful palate of bright raspberry, strawberry and rhubarb flavors framed with a touch of barrel toast. This lovely magnum is medium bodied with a clean, integrated line of acidity, and you’ll get to take home 1.5 liters worth of this delicious wine! You and three friends will also get to experience a seated tasting of five wines on their rustic patio with a stunning view of Dry Creek Valley. They’ll introduce you to the intricacies of each specific vineyard and its location and pair the wines with carefully chosen cheeses that will leave you wondering where the wine ends and the cheese beings. Restrictions: Reservations are required. Please give the winery 48 hours notice. The lucky bidder of this item will take home two delectable bottles of Trattore Farms wine: a bottle of 2013 T. Bucher Proprietor’s Reserve that will intrigue your nose with its aromas of blackberry, anise and wild strawberry, dark cherries, baking spices, toasty oak and vanilla, and a bottle of 2015 Zinfandel Reserve with its brambly, eucalyptus, and black pepper nose. The palate of the Zinfandel offers violets, blueberries, and boysenberries with a hint of baking spices followed by a smooth, lingering cocoa finish. To top off this package, you’ll also get to experience their delicious, locally produced olive oil when you take home a bottle of their Healdsburg Blend. The practice of pressing the fruit right as it comes off the tree, coupled with the utmost care in creating their blends has resulted in healthful, vibrant, award-winning oils. Grgich Hills’ Cabernet is packed with rich aromas of black cherry and licorice with a hint of mocha and vintage leather. Its full body and fine-grained tannins make it the perfect partner with grilled steak, rack of lamb or roasted duck. Their Yountville Vineyard forms the heart of their Napa Valley Cabernet Sauvignon, with their Rutherford and Calistoga vineyards rounding out the blend. To boost complexity, they rely on a traditional Bordeaux blend of predominantly Cabernet Sauvignon, with a dash of Petit Verdot, Merlot and Cabernet Franc. The result is a full-bodied, elegant Cabernet Sauvignon with pure flavors and a pronounced sense of place.